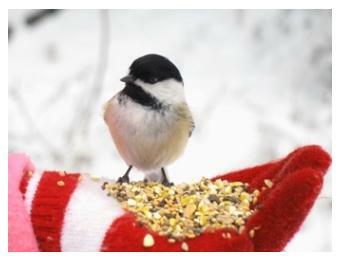 The cheerful Chickadee with it's clear call of "Chicka-dee-dee-dee" is easy to spot, as this little bird is not shy and is easily enticed to the back garden bird feeder. Measuring about 13 cm from top to tail, this bird is easily identified by its black cap, white face and black bib. Their body feathers are buff and their black tail feathers are edged in white. 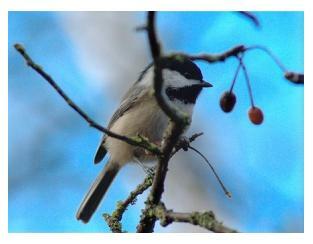 These small, active birds are attracted to your bird feeders with a mixed bird-seed, suet, sunflower seeds and peanuts. Their cheerful call is one of the delights of the outdoors in winter. We see them in our garden in both Summer and Winter as these birds are non-migratory and stay in this area all year long. 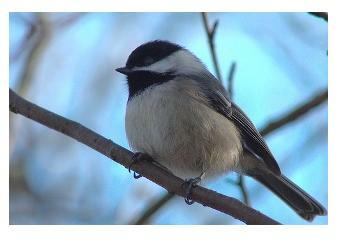 In this area of Southern Ontario the Black Capped is the most familiar of the over 50 species of Titmice and Chickadees that live world-wide. They are often found foraging in small flocks of between 12 and 20 birds, throughout woodlands or at back yard bird feeders. They prefer evergreen woodlands and can be attracted to your garden by plantings of coniferous trees such as Hemlock, Fir or Pine in which they can hide. They like to feed on insects that they find under the bark of evergreen trees. Their preferred nesting spot is in the cavities of trees, where they use holes that already exist, perhaps made by wood-peckers or by a limb falling from a tree. If there are no cavities available for them, they will make one themselves by digging their own hole in rotting wood. The 6 to 8 small white eggs are laid and incubated by the female and they hatch in about 14 days, while the male brings his mate food during this time. Both parents work to raise their nestlings. The babies are fledged and ready to leave the nest about 16 days after they hatch and the nestlings stay with their parents for a further 3 to 4 weeks before they leave the nest completely to fend for themselves. I'm told that these little bold birds will take a seed or nut from your hand, if you stand quietly with your still arms outstretched, although, I have never tried it. The little bird in the picture, here, seems to be feeding quite happily from the hand of the girl feeding her! It might work if you already have these birds coming to your bird feeder, so that they already expect there to be food and no enemies. I'm going to try it, so check back here and I'll let you know what happens! The photographs on this page are reproduced by kind permission of Mary A Wilson, Pete Lypkie and Dreamstime. This site, from Lakehead University, has good information for those interested in this bright little bird.